I absolutely love the holiday season but I confess I’m having a harder and harder time about the Christmas tree. I’ve always had a thing for trees in general, not just the Christmas variety. They’re so beautiful and stately. They speak to me. It’s like they have souls. Whenever I’ve had to have a tree cut down, I’ve always felt like I was murdering it, even if it was already dead and about to fall on our house. I’d still have to go out and talk to it, apologize profusely to it, thank it for being such a beautiful part of our landscape, personally forgive it for all those Roto-Rooter calls. Olof calls me a serial anthropomorphizer and he doesn’t mean it kindly. It broke my heart when we had to cut down the 40-foot Brazilian pepper tree, home of three tiers of tree forts. Even the kids got a little sentimental. The 30-foot rubber tree broke my heart too. Unfortunately it also broke the pool deck and was working on the pool itself. In recent years it has taken me forever to pick out a Christmas tree. It’s like they’re all saying “Choose me! Choose me!” Each and every one of them gave up its life to bring someone happiness. How can I reject any of them? (Olof’s answer: Um, because we don’t have room for 500 trees?) You’d think I was the kid who was the last one picked for dodge ball. (Okay, I WAS the last kid picked for dodge ball.) Passing a Christmas tree lot the day after Christmas and seeing all those trees that weren’t picked, I have to close my eyes. This is definitely not good if you’re driving. It was all a lot simpler in my grossly over-stressed single mom years. I felt the same way about trees then as I do now but I only had time and emotional energy for tree angst-lite. Maybe I could use some hobbies. Of course, people are going to write and say, “So get a fake tree already.” Unfortunately, we have no garage in our tiny house so it would have to be up all year round. I suppose we could take the ornaments off and pretend it was a palm. Like anyone would fall for that. People who keep Christmas trees up all year round get reputations. The four weeks each year that we have the tree up are absolute heaven. The second a tree lot is open, we’ve got a tree. Opening the boxes of ornaments is like greeting old friends, a topic on which I always wax emotional and which for some reason annoys the bejeezus out of the kids. (“No! No! Not the ‘old friends’ speech again!”) But the ornaments all have a history starting with the ones from both my childhood and Olof’s. (When she moved to assisted living, his mother sent me a shoebox of her Christmas decorations which I labeled “Olof’s treasured family ornaments,” not that the famously unsentimental Olof remembers a single one.) Then there’s the adorably hokey ones the kids (and even Olof!) made in kindergarten from construction paper or flour-and-water paste concoctions, and, of course, the ones I acquired during my travels or which were gifts from beloved people. Personally, I think there’s nothing wrong with having pathological attachments to inanimate objects. During December, a month of multicultural mayhem at my house, I spend my evenings happily parked in my favorite chair with my CDs of Swedish Christmas carols on perpetual repeat, mesmerized by the twinkly tree lights, scarfing latkes, and hoping the menorah doesn’t accidentally ignite the nativity scene on the mantel. At least the menorah doesn’t make you feel guilty when you pack it up in its box until next year. Taking down the tree is my least favorite task of the year. It’s usually a fire hazard by that time, of course, and more of its needles are on the floor than on the tree. Still, when Olof hauls it out and puts it by the curb awaiting further disposal, I am a total wreck. I can feel its anguished reproof: This is how you treat me after all the pleasure I gave you???? You cut me down in my prime (well, maybe not you personally but you know what I mean) all so that it could end like this??? 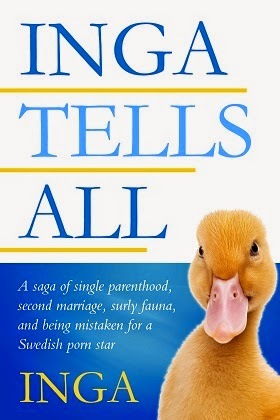 News flash, Inga! Tomorrow I’m going to be mulch! If it wants me to feel bad, it’s succeeding. I know. Cue the net.